Manchester City take on Arsenal at the Etihad Stadium on Sunday afternoon, looking to get back to winning ways and keep pressure on Liverpool. Who will come out on top? This post contains our Manchester City vs Arsenal betting preview with predictions, betting tips, probable lineups, team news, enhanced odds, bonuses and no deposit free bets on this mouth-watering match! Manchester City suffered a shock 2-1 defeat to Newcastle United on Tuesday, although were relieved to see first-placed Liverpool only draw with Leicester the following day. That result left Man City five points adrift of the Reds with 14 matches remaining while Tottenham clawed within two points of second. The Citizens netted 30 times in their other seven fixtures across January but they have claimed just 2 clean sheets in their last 11 Premier League games. Pep Guardiola's men will be relieved to be back at the Etihad Stadium on Sunday – a venue where they have won 11 of their 12 league matches this season and scored an eye-watering 40 times. Man City skipper Vincent Kompany remains sidelined and so John Stones and Aymeric Laporte are expected to continue their partnership in the heart of defence. Benjamin Mendy has trained with his team-mates in the last couple of days but Danilo is expected to replace the Frenchman as left back. Goalkeeper Ederson should be fit to play despite picking up a minor leg injury last time out. Changes are a possibility in midfield and up front Riyad Mahrez, Gabriel Jesus, Bernardo Silva and Ilkay Gundogan clamouring for a recall in midfield and attack. Anyway, though Raheem Sterling, Leroy Sane and Sergio Aguero may be given another chance to impress before possible rotation in midweek. Arsenal kept their Champions League aspirations alive with a 2-1 win over Cardiff on Tuesday. They sit in the top four, level on points and goal difference with Chelsea, but the North Londoners have scored 50 goals to the Blues' 40. Unai Emery's men have a disappointing away record in recent times. They haven’t won a Premier League away game since their 2-1 triumph at Bournemouth on November 25th and their only success from their last 6 matches on the road came in the FA Cup at League One Blackpool. As to direct matches, the Gunners have lost seven of their last 11 visits to Etihad Stadium in all competitions. Furthermore, Arsenal have claimed just three points from a possible 39 when travelling to the Big Six since the start of 2016/17 (W0-D3-L10). Denis Suarez could be set for a debut after moving to north London on loan from Barcelona. Mesut Ozil struggled to make an impact against Cardiff and looks unlikely to feature here. As a result, we expect Aaron Ramsey to play behing the front duo, Alexandre Lacazette and Pierre-Emerick Aubameyang. In defense, Nacho Monreal should fill in at centre-half alongside Shkodran Mustafi. Granit Xhaka, Lucas Torreira and Matteo Guendouzi are expected to anchor the midfield. Rob Holding, Hector Bellerin and Sokratis Papastathopolous remain sidelined while Ainsley Maitland-Niles and Laurent Koscielny are major doubts. 888sport offer 5/1 Manchester City or 55/1 Arsenal to win! Max bet £5! Man City (4-3-3): Ederson, Walker, Stones, Laporte, Danilo, De Bruyne, Fernandinho, David Silva, Sterling, Aguero, Sane. Arsenal (4-3-1-2): Leno; Lichtsteiner, Mustafi, Monreal, Kolasinac, Xhaka, Torreira, Guendouzi; Ramsey; Lacazette, Aubameyang. Here at Bet and Skill, we compare odds from over 70 online sportsbooks and you can find below the highest prices on Man City v Arsenal match winner market. Plus, several UK's top online bookmakers are offering tons of enhanced odds on this clash! Take a look! Get 25/1 Manchester City to beat Arsenal with Betfair! New Customers can get Man City at an enhanced 25/1 to beat Arsenal. Max Stake £1. Winnings paid in free bets, valid for 7 days, only deposits with cards/Paypal count. Exchange and multiple bets excluded. T&C’s Apply. 18+|Gamble Aware. Get 80/1 Arsenal to win vs Manchester City with Betfair! New Customers can get Arsenal at an enhanced 80/1 to beat Man City. Max Stake £1. Winnings paid in free bets, valid for 7 days, only deposits with cards/Paypal count. Exchange and multiple bets excluded. T&C’s Apply. 18+|Gamble Aware. Games between top clubs in Premier League are very tough to predict but our professional bettors have deeply analysed all the stats and info regarding the two teams and you can find below our betting tips on Manchester City vs Arsenal. Feel free to copy them and leave a comment below if you bash the bookies! We also offer predictions on horse racing and football (including Premier League betting tips) each and every day so make sure you take a look at what our experts are saying before placing your bets. Throughout BetAndSkill.com you will find our best bets and match analysis that include over/under tips, first goalscorer tips, anytime goalscorer tips, BTTS tips. Follow us on Twitter to get notifications of when our football tips and betting promotions are posted so you never miss a winning prediction or a no deposit free bet! Get 30/1 Man City to beat Arsenal at BetVictor. Max bet £1! New Customers only. Place a maximum £1 bet on Manchester City to win Match Betting - 90 mins. If it wins, get the enhanced odds paid out as free bets; cashed out bets excluded. 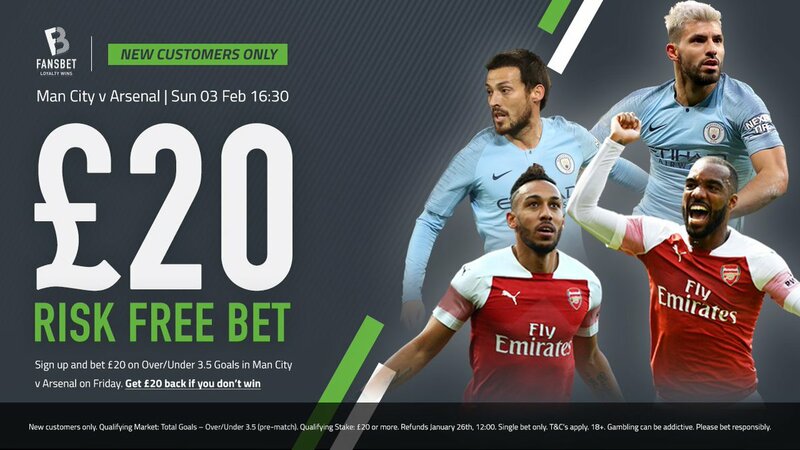 Offer valid from 09:00GMT on Saturday 2nd February 2019 until 16:30GMT on Sunday 3rd February 2019. Credit or Debit card only, minimum £5 deposit. Geographical Restrictions. T&Cs Apply. "Man City vs Arsenal Betting Tips, Predictions, Lineups & Odds (Premier League - 3.2.2019)"